There is an inordinate rate of accidents within medical helicopter aviation, with the 2010 NTSB data proof in point. Legislation that would significantly raise Medicare rates for emergency air medical providers is working its way through both chambers of Congress. The nation's largest air ambulance company expects passage soon. Bills in the House and Senate would increase Medicare payments for air-ambulance services and establish a data-reporting program for all companies that provide emergency air medical transportation. The House version would raise Medicare rates by 20% starting Jan. 1, 2016, and an additional 5% from 2017 through 2019. The Senate version starts the reimbursement hikes one year later. The Association of Air Medical Services, the lobbying group for companies that operate emergency medical aircraft, has pushed for Congress to pass the bills. Air Methods Corp., a member of AAMS and the largest provider of air medical transportation in the U.S., believes legislators will take up the issue after the August recess. Nabbing a 20% boost to Medicare payments would significantly benefit the bottom line of Air Methods, an Englewood, Colo.-based company with $1 billion in revenue. Two of the Senate's co-sponsors—Democrat Michael Bennet and Republican Cory Gardner—hail from Colorado. About 36% of Air Methods' patient revenue in the second quarter this year came from Medicare. Private payers accounted for 26% of reimbursements. But the legislation would also benefit the many other companies that offer emergency helicopter services. Some health systems operate their own medical aircraft, including Memorial Hermann Health System in Houston and Dartmouth-Hitchcock Medical Center in Lebanon, N.H. Although the use of air ambulances has the potential to save patients' lives, it is also a costly and dangerous endeavor for both providers and patients. Even commercially insured patients have to occasionally pay large sums of emergency air transportation bills. Private health insurance companies often differ on how they will cover the services. For example, Aetna (PDF) uses American Medical Response as its “preferred medical transportation” for its commercial and Medicare members, meaning Aetna patients could be on the hook for the full bill if they use a different company. 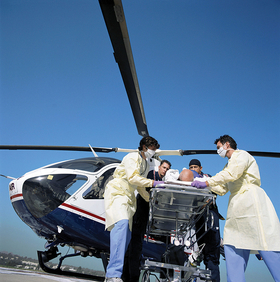 The use of air ambulances also generally has to meet certain criteria. UnitedHealthcare (PDF) will cover emergency medical helicopter services only if the patient is going to an acute-care hospital and ground transportation isn't feasible.